There are several recipes of "fingers" with jam. The dough may be yeast or shortcrust, and the filling remains unchanged. Best suited thick sweet jam: pear, strawberry, plum or Apple. If you have time, prepare a gentle air "Toes with jam" on yeast dough. Though for this recipe it should not stand, as usual, for 1.5-2 hours. Fifty minutes is enough to cook and cool the dough. - 1 sachet of vanilla sugar. Before the beginning of the test creation process in about 30 minutes, remove the butter from the fridge to make it soft. Crumble yeast into sour cream, add butter, mix the ingredients. Egg lightly whisk with a fork, pour in the batter. There also put the vanilla, millet flour and salt. Unlike traditional dough, it is not necessary to knead long enough 3-5 minutes. Next, divide it into 4 pieces, place each food in the cellophane, put the pieces in a bowl, put it on half an hour in the freezer. After this time put the bowl in the refrigerator compartment, remove the first piece, roll it into a pancake thickness of 0.5, see Cut it into 10-12 triangular sectors. Spoon a tablespoon of jam, put it on the outside of the triangle, press lightly with a spoon so that the surface was smooth, sprinkle it with nuts, roll dough into roll to a sharp edge. So, all the little salmon bagels with jam. Put them on a sufficient distance from each other on promaslennyh baking sheet. Mentally place between each one such mini croissant. When baking the fingers will increase, they will not interfere with each other and will not stick together. Brush the surface lightly with the beaten egg. Put the baking sheet in a preheated 190оС the oven, hold it there for 15-20 minutes. If you have the product turned out small, it will take 15 minutes. For baking large bagels can slightly increase the time. 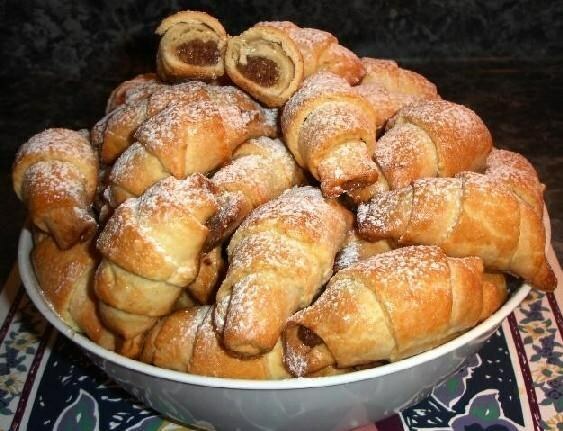 One of the most popular desserts in the USSR fingers sour cream pastry. It is cooked quickly, baked items for a few minutes, turn out tasty and delicious. Make them easy, so these types of homemade bagels popular to this day. - 3 tbsp sugar for dusting. Softened butter mixed with sour cream, add soda, flour, kneaded the dough, divide into 4 pieces, remove half an hour in the fridge. After that, each part should roll out too in a circle 5 mm thick, cut into triangles. Brush the surface of each jam, roll it into a loaf, fold in the form of a horseshoe. Put the product on a baking tray lined with paper and greased with butter, sprinkle with sugar, place in oven preheated to 200oC, bake for 25 minutes.